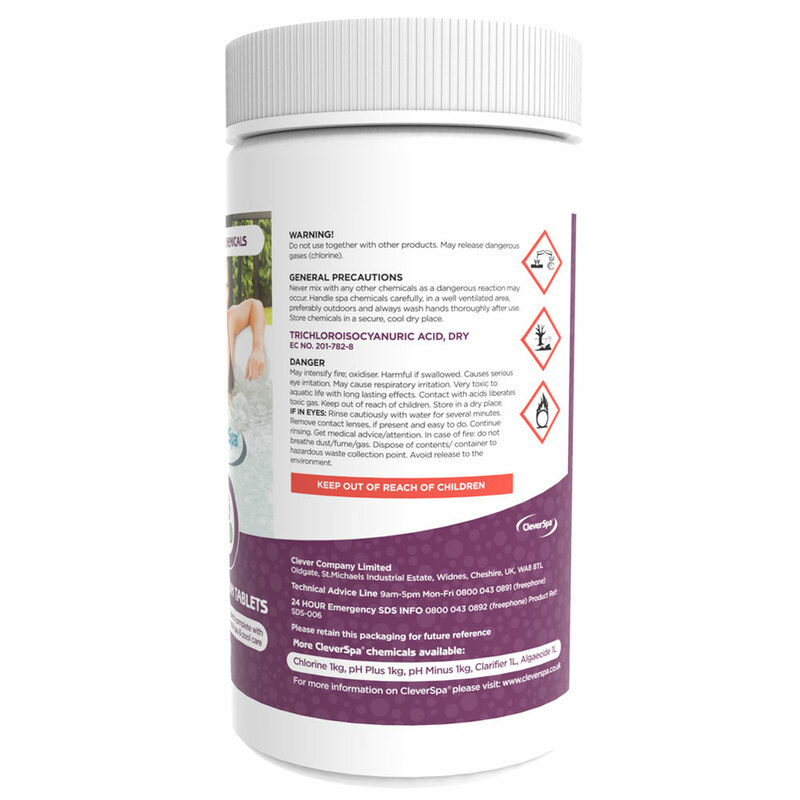 High strength, Chlorine Tablets complete with Algaecide and Clarifier for total spa and pool care. 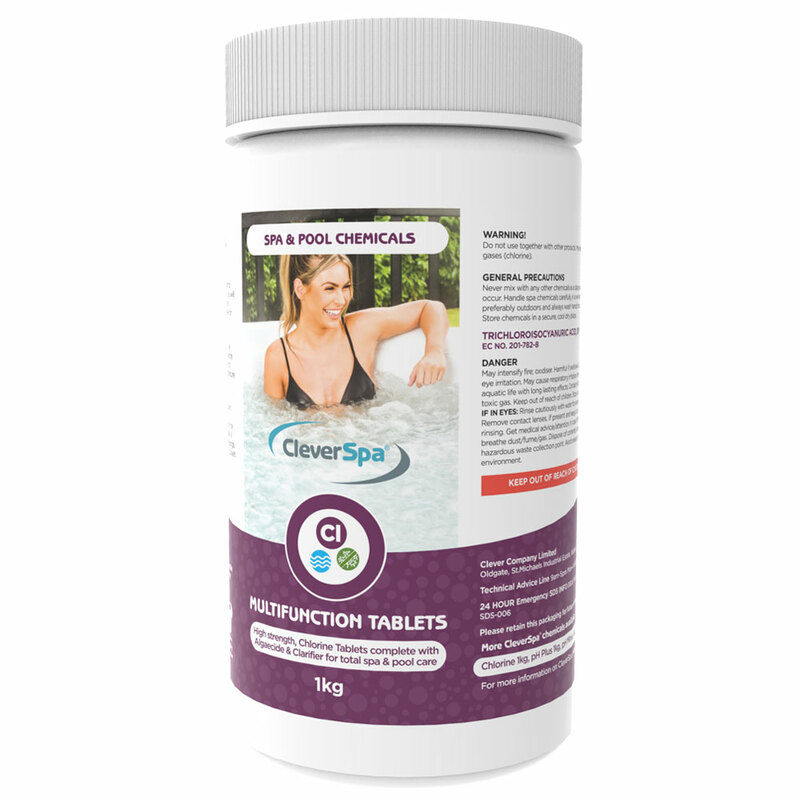 CleverSpa® Multifunction slow-dissolving tablets are a popular method of sanitising spa and pool water. 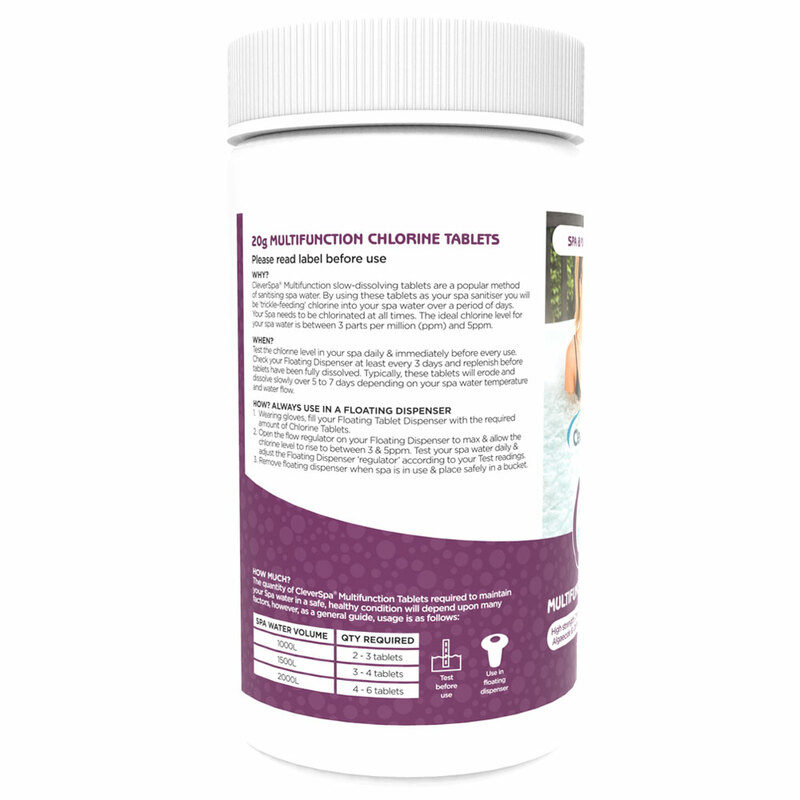 By using these tablets as your spa sanitiser you will be ‘trickle-feeding’ chlorine into your spa water over a period of days. Your spa needs to be chlorinated at all times. The ideal chlorine level for your spa water is between 3 parts per million (ppm) and 5ppm. 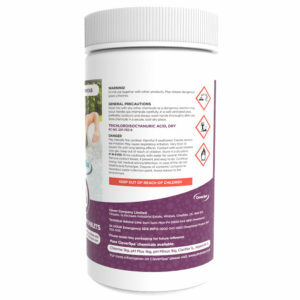 How often do I need to use CleverSpa® Multifunctional Chlorine Tablets? Test the chlorine level in your spa daily and immediately before every use. Check your Floating Dispenser at least every 3 days and replenish before tablets have been fully dissolved. Typically, these tablets will erode and dissolve slowly over 5 to 7 days depending on your spa water temperature and water flow. 1. Wearing gloves, fill your Floating Tablet Dispenser with the required amount of Chlorine Tablets. 2. Open the flow regulator on your Floating Dispenser to max and allow the chlorine level to rise to between 3 and 5ppm. Test your spa water daily and adjust the Floating Dispenser “regulator” according to your Test readings. 3. Remove floating dispenser when spa is in use and place safely in a bucket. Please note: Test before use and use in a floating dispenser. Do not use together with other products. May release dangerous gases (chlorine). Never mix with any other chemicals as a dangerous reaction may occur. Handle spa chemicals carefully, in a well ventilated area, preferably outdoors and always wash hands thoroughly after use. Store chemicals in a secure, cool dry place. May intensify fire; oxidiser. Harmful if swallowed. Causes serious eye irritation. May cause respiratory irritation. Very toxic to aquatic life with long lasting effects. Contact with acids liberates toxic gas. Keep out of reach of children. Store in a dry place. IF IN EYES: Rinse cautiously with water for several minutes. Remove contact lenses, if present and easy to do. Continue rinsing. Get medical advice/attention. In case of fire: do not breathe dust/fume/gas. Dispose of contents/ container to hazardous waste collection point. Avoid release to the environment.